Have you ever wanted to be on Food Network television? I have. I’d love to cook in the Hamptons with Ina or barbecue with Bobby Flay. This week I got my chance, well, sort of. I played a home version of the television show “Chopped” with my friends in my Cooking Club. “Chopped” is the show where contestants receive a basket of mystery ingredients and have to cook a dish using all those ingredients within a time limit. We based our game on the show but came up with our own home version. Here’s how it worked: First we gathered at my neighbor Cari’s house, and she and I were team captains. She bought my team a bag of mystery ingredients, and I selected the ingredients for her team. Each bag had 3 ingredients plus boneless skinless chicken breasts. We agreed to pick items that would be a little challenging but not extra crazy. The goal was to cook a meal using all the mystery ingredients plus anything in the pantry and refrigerator. We agreed that the meal would be roughly a protein, vegetable and starch. The time limit was one hour, and internet use was allowed. Each team cooked at separate houses, and then we reconvened at the first house to reveal our meals and to eat. Once our friends arrived at Cari’s house, we randomly assigned them to a team. 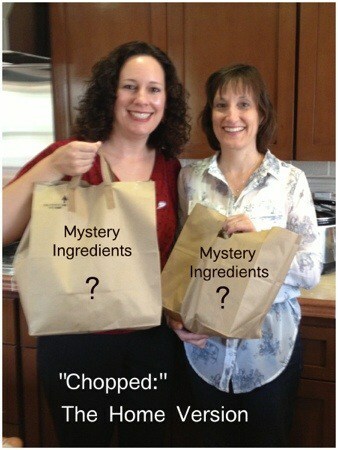 After much anticipation and suspense, each team opened up their bag of mystery ingredients. 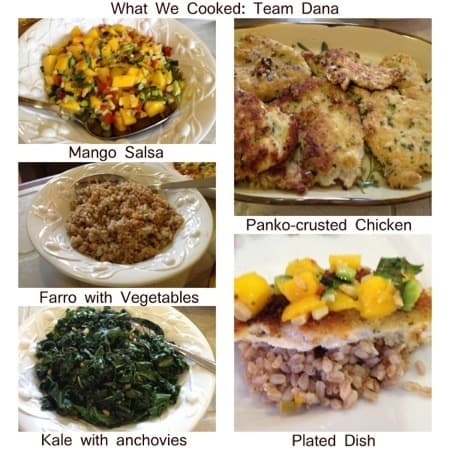 Team Dana’s mystery ingredients were mango, kale, anchovies, and chicken breast. Team Cari’s mystery ingredients were Japanese turnips, fig balsamic glaze, fennel seeds, and chicken breast. As soon as the teams were assembled, my team raced down the street to cook at my house. My co-chefs took a quick look in my pantry and refrigerator, and we quickly came up with a menu and divvied up the work utilizing each person’s strengths. It was a little challenging for them to cook in my kitchen because they didn’t know where anything was or how hot my stove runs. But they are experienced cooks and we have a similar healthy cooking style, so everything did run smoothly. 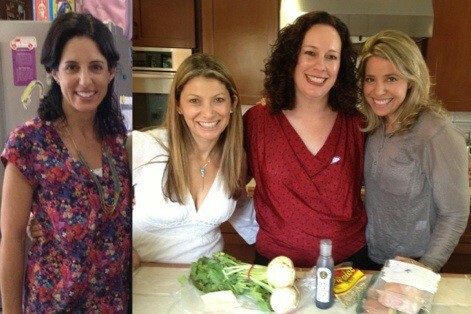 Jacqui thought it was so interesting to cook with friends and to see how they do things and to learn from each other. We got a little relaxed as we were each doing our jobs and chatted quite a bit. Then all of a sudden the time was disappearing, and we ending up needing five extra minutes to finish cooking our chicken. Oh well, the other team had their chicken in the oven until we arrived back at Cari’s house. We rushed back up the street and were dying to know what had transpired at the other house. We had our big reveal in the kitchen and showed each other what we cooked. 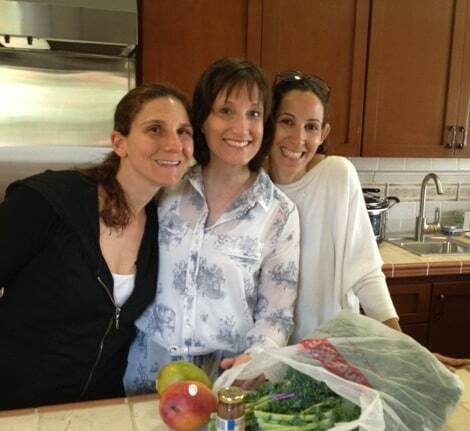 Here’s how Team Dana used their mystery ingredients: mango, kale, anchovies, and chicken. We cooked panko-crusted chicken. The chicken was breaded with an egg wash and seasoned panko crumbs and then pan-fried in a little grapeseed oil. We topped the chicken with a mango salsa comprised of mango, red pepper, Thai basil, lime, spring onion, and toasted corn. The real challenge was using the anchovies. We decided to use them as the umami flavoring for the kale. The anchovies were finely chopped and lightly sautéed. Then the kale was sautéed with the anchovies and with maple syrup to round out the flavors. To complete the meal, we added farro, which we knew would be a crowd pleaser. 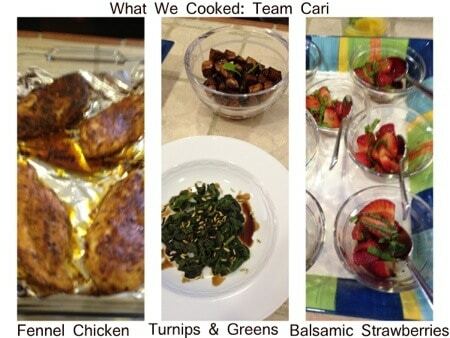 Here’s how Team Cari used their mystery ingredients: fennel seeds, Japanese turnips, fig balsamic glaze, and chicken. They roasted their chicken with a fennel curry spice rub. They had fun playing around with all of Cari’s Penzey’s Spices and admitted to serious “spice envy.” None of them had ever cooked with turnips before, but they made a delicious roasted balsamic turnip dish. They even sautéed the turnip greens in balsamic and fennel seeds. Lastly, they made a dessert of sliced strawberries with balsamic vinegar and mint from Cari’s garden. Cari fell so in love with my Fig Balsamic Glaze that she decided she had to keep it even when the game was over. After the reveal, we snapped a few quick photos and couldn’t wait to taste everything. We ate together in the dining room where Cari had set a beautiful table. The real test began as we ate the food and commented on all the dishes. We were all winners because we had a fun time cooking together and enjoyed a delicious meal. Really, all the food came out so well that no one was “chopped.” We had fun swapping stories about what had happened at each house. The “Chopped” experience was so great that we can’t wait to do it again. Throw A “Chopped Challenge” Dinner Party for several couples or friends. Have a Date Night Chopped Challenge with your significant other. Let the cooking competition begin! 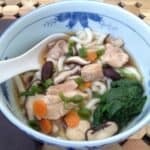 Dana, thanks for linking to my Chopped Challenge dinner party article. I enjoyed reading about your Chopped party. My husband and I sometimes find ourselves playing a mini-version of Chopped when we aren’t feeling particularly inspired about making dinner. One of us will pull out three or four ingredients from the pantry and refrigerator and let the other go to town. 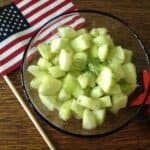 Deb- thanks for checking out my Chopped Party. 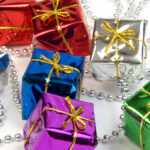 I love reading about the different variations of this theme, including all of yours. This type of party is so different, fun and creative. Thank you for the inspiration. Kim- I think you would love this. You should do a dessert round with your friends in AZ. As one of the contestants, I can’t tell you what a wonderful time we all had and we can’t wait to do it again! Jen- thanks for leaving a comment and for being a part of a fun event.